Beatmania II DX 19: Lincle is the 19th installment of the wildly popular "Beatmania" series. It retains the basic gameplay concept but with several new features and over 60 new songs. <b>Features</b> Beatmania II DX 19: Lincle features several new features, such as various new player modes to choose from. Players can make the game easier or harder with modes including "Free Plus Mode," "Hazard Mode," "EX Hard Mode" and "Sudden + Mode". There is also a new help display for players and song previews for songs from Dance Dance Revolution. With II DX 19: Lincle PASELI users can also now purchase a new pass known as "DJ VIP PASS" that can be done before playing the first stage. There are also unlockable features including the "Lincle Kingdom" system. In the Kingdom, the player's avatars defeat monsters to unlock songs. The Licncle Link system and "Append Travel" stage also unlock content including songs and accessories for the player's avatar. <b>Gameplay</b> Beatmania IIDX 19: Lincle retains the same basic gameplay as other models. Player hit notes that fall from the top of the screen using either keys or a disc to be scratched in order to fill up the "Groove Meter". Gameplay features from Beatmania IIDX 17: Sirius - "Backspin Scratch" and "Charge Notes" (where players hold the key until the end of the note) - also make a return with IIDX 19. With its fresh and exciting take on the popular series, the Beatmania II DX 19 is sure to draw in new players as well as existing Beatmania fans. Our offer is for the CRT model machine. Beatmania II DX 19: Lincle features several new features, such as various new player modes to choose from. Players can make the game easier or harder with modes including "Free Plus Mode," "Hazard Mode," "EX Hard Mode" and "Sudden + Mode". 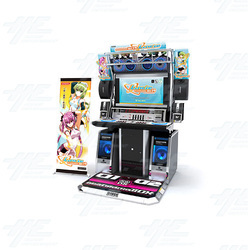 There is also a new help display for players and song previews for songs from Dance Dance Revolution. With II DX 19: Lincle PASELI users can also now purchase a new pass known as "DJ VIP PASS" that can be done before playing the first stage. There are also unlockable features including the "Lincle Kingdom" system. In the Kingdom, the player's avatars defeat monsters to unlock songs. The Licncle Link system and "Append Travel" stage also unlock content including songs and accessories for the player's avatar. Beatmania IIDX 19: Lincle retains the same basic gameplay as other models. Player hit notes that fall from the top of the screen using either keys or a disc to be scratched in order to fill up the "Groove Meter". Gameplay features from Beatmania IIDX 17: Sirius - "Backspin Scratch" and "Charge Notes" (where players hold the key until the end of the note) - also make a return with IIDX 19. With its fresh and exciting take on the popular series, the Beatmania II DX 19 is sure to draw in new players as well as existing Beatmania fans. Our offer is for the CRT model machine. This machine must be connected to a Japanese Server and you must pay a regular subscription fee in order for the machine to work. If you do not do this, the machine will not turn on.